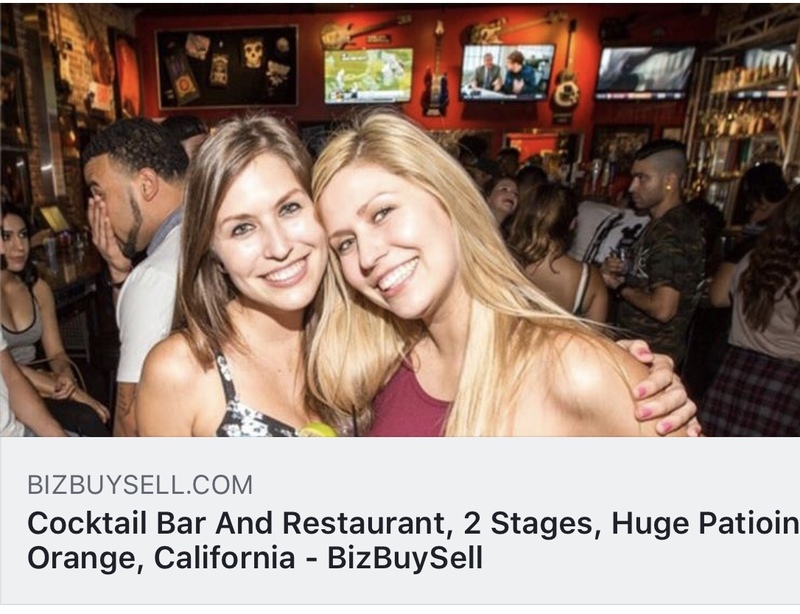 A bar just came on the market in Orange County, and it looks and smells a lot like Fullerton’s infamous SlideBar. Check it out. The listing says it’s in Orange, CA, but the description matches Fullerton loudest chugghub to a T. I’m told the photo matches the Slidebar interior, too. I wonder if the new owner will still be able to blast amplified outdoor music into the surrounding residences without a permit. But not in Fullerton. 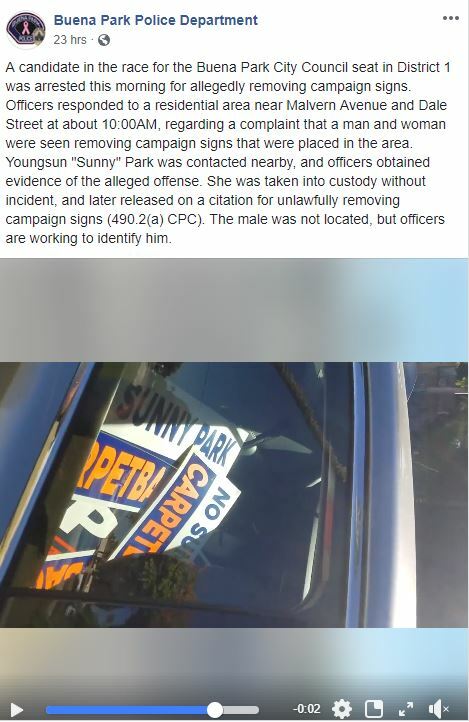 Here’s a note from the Buena Park Police regarding a political sign thief who was apprehended yesterday. Why can’t they figure this out in Fullerton? First Fox11, now KTLA. It looks like the news is starting to take notice of the Mayor’s wife’s pilfering. Paulette Marshall Chaffee has also moved into Stage 3 in Kübler-Ross model of grief. Last night Fox 11 News came down to Fullerton for an investigation into Paulette Chaffee’s sign stealing and carpetbagging. It’s been a week since Pilfering Paulette was busted interfering in our local election. Since then no comment from either of the Chaffees concerning allegations of theft, censorship, poor choices, or anything resembling acknowledgement of wrong doing. Notable in yesterday’s coverage, Paulette hung up on the reporter. Doug? Well, he couldn’t be reached for comment. 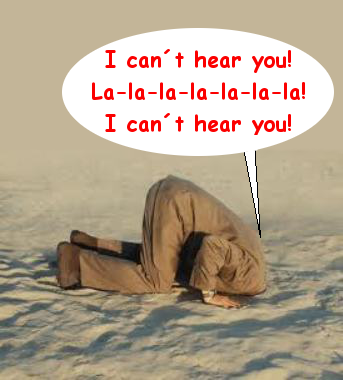 Who really wants an elected official word who responds to a crisis by ignoring it? 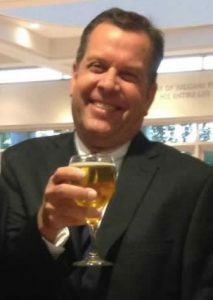 The name Petropulos is long associated with Fullerton law enforcement circles. John Petropulos was a Fullerton Police Officer between 1981 and 2010, rising to the position of Captain. He also taught for many years at the Fullerton College Police Academy. The chances are good that if someone you know attended the academy over the past decade or two, they know and have stories to tell about John Petropulos. 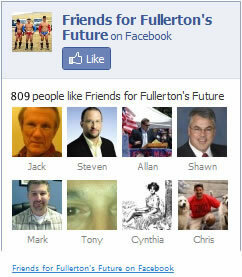 His son, Tim, was hired by the Fullerton Police Department in 2005 and was a Sergeant handling Internal Affairs. Many believed Tim would follow in his dad’s footsteps, until he and Cpl. 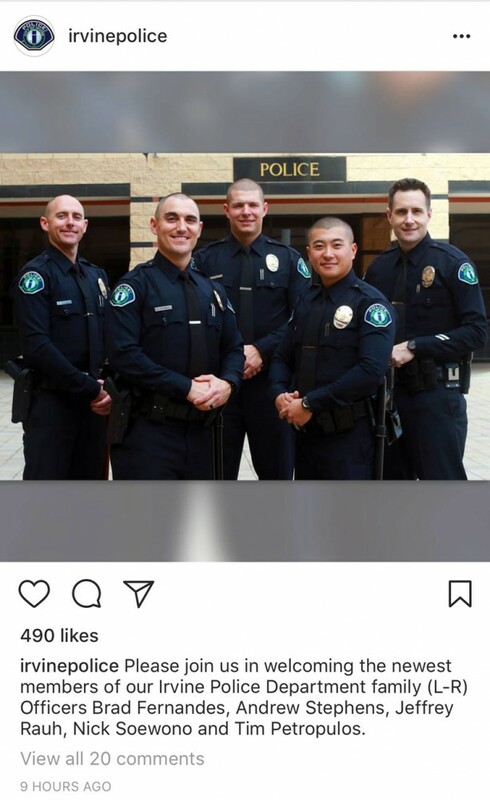 Brad Fernandes jumped ship this past week for the Irvine Police Department. Tim’s departure is noteworthy because his transfer to Irvine PD came with a demotion from Sergeant to Police Officer. Voluntary demotions are not unheard of, but certainly not the norm. Adding to this strange turn of events, Irvine Police Chief Mike Hamel is currently married to Fullerton Police Lt. Kathryn Hamel, the sister of former Fullerton Police Captain George Crum. Having a loved one in law enforcement is apparently necessary for upward and lateral mobility these days. Lest anyone from the FPD come forward to bemoan that Fullerton doesn’t pay enough, you should know that Fullerton has paid less than other cities for a very long time. This is nothing new. So why are Fullerton Police officers quitting in droves for other departments? Dan Hughes promised everyone for years this was now a reformed, and better-than-ever police department. If true, why wouldn’t people want to stick around and be part of that? Nails. Coffin. Dan Hughes’ legacy as police chief. Meet your hammer. Is it just me, or have things been getting a little tense lately? 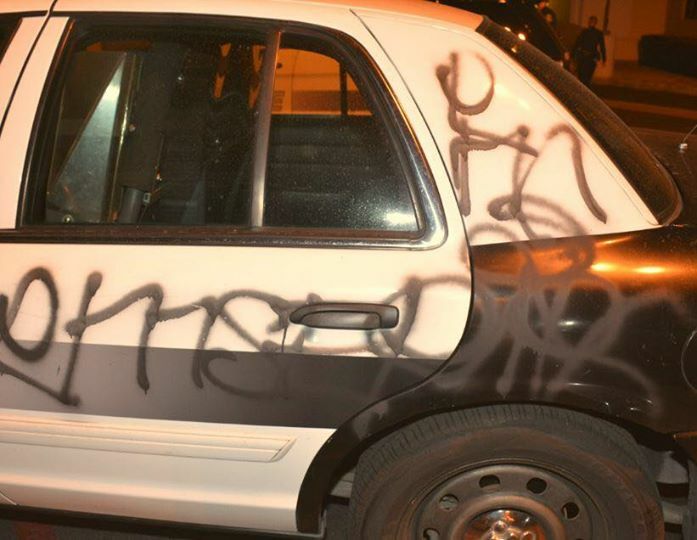 The Fullerton PD just publicized these photos of a patrol car that was tagged with graffiti by a downtown reveler over the weekend. The vandalism allegedly occurred while the officers were away on “proactive” foot patrol. The social media pronouncement was accompanied by some humorous posturing, including the hashtag #WeWillFindYou. Now anyone who’s filed a graffiti or vandalism report in the city of Fullerton knows that these types of crime reports usually get stuffed in a drawer, dismissed as non-priorities. You’d be lucky if you can get a cop to come out and take a report, let alone collect evidence and track down the perp. In this case, some egos have been offended and so we might expect to see some sort of minimal effort expended. But I wouldn’t count on it. Welcome back and Happy New Academic Year! It’s wonderful to see our faculty, staff, and students breathing life back into our campus community. Each of you bring such energy to the University and a love for teaching, learning, and listening that empowers all Titans to Reach Higher in our classrooms and throughout our diverse communities. We are at a moment in history when the marketplace of ideas that we at Cal State Fullerton promote and protect through equity, inclusion, and civil discourse has the power to heal and lead a wounded nation. The last time we were all together, we witnessed the transformative power of upholding these and other core tenets with what was arguably the greatest achievement of our now 60-year history: the commencement of our largest graduating class — nearly 11,000 diverse Titans, the majority of whom were low-income students and/or the first in their family to put on a college graduation cap. For years, I’ve made it a practice to read what’s written on the backs of those caps; I find the messages not only inspiring, but also indicative of the collective mood of our nation through the words of the young people who will soon be leading it. As a woman of color, a Godmother and Tía, a proud American, and most of all, as president of a University founded on the very principles of equity and inclusion that have recently come under attack in ways this nation hasn’t seen in half a century, I am proud that at this past commencement a rising tide of peaceful resistance was evident in the words of our graduates’ speeches, in the spirit of their families’ cheers, and of course, on the backs of their graduation caps. “Love Trumps Hate,” another said in rainbow letters. Fellow Titans, just as that time had come for Martin Luther King, Jr. when he first said those words in 1967, it has come for us now. As the faculty, staff, and students of the largest university in the most diverse system of higher education in the country, it is time for us to wield the power of our collective voice to let the world know that we stand firmly and proudly on the right side of history with our immigrant brothers and sisters who made this country great long before it was a campaign slogan; with our undocumented students who have nothing to do with how they came to America and everything to do with what it means to be an American; with our Muslim faculty, staff and students who face travel bans that may impede their work and education; with African American students around the nation who attend classes in buildings named after Confederate generals who fought to keep them out of those buildings; with our LGBTQ community who fear losing their well-earned rights; and with our Caucasian Titans who remain deeply embedded in Cal State Fullerton’s definition of diversity and whose presence and voice is integral to who we are and what we aim to become. As a public university that fosters a learning environment in which diverse perspectives from both sides of the political aisle are central to our mission, we are in a unique position to lead the country during this pivotal moment of history. We will do so by upholding the First Amendment rights enshrined in our constitution while also supporting those who may be hurt, scared, or offended by that speech, recognizing that our rich diversity is our most prized asset and that intolerance in any form is an affront to all of us. Paramount to this endeavor is safeguarding the physical safety of all faculty, staff, and students by providing a violence-free academic environment grounded in the mutually respectful exchange of ideas from all sides. Welcome home, fellow Titans. Let’s embrace the work ahead, the challenges our nation faces, and most importantly, each other. OK, we get it. Diversity good, political violence bad. Who can disagree with that? As you scroll through the anti-Trump rhetoric, you may notice one glaring omission. 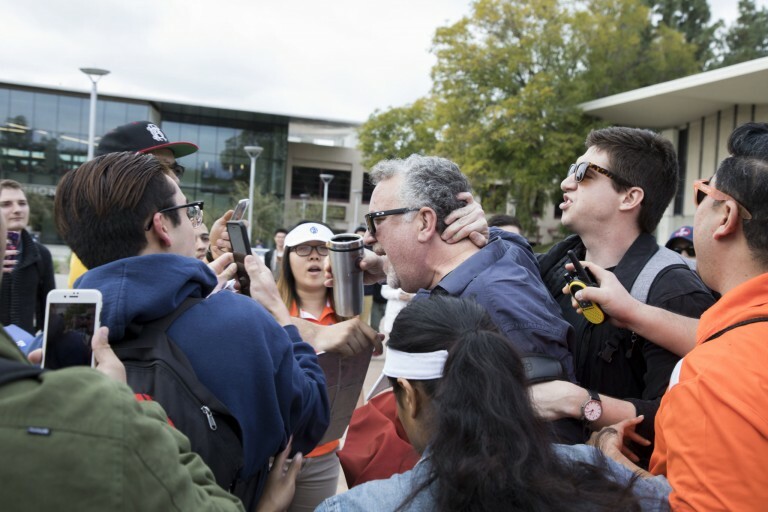 Garcia neglected to denounce the hatred and political violence that occurred on her own campus, by her own employee, Professor Eric Canin. If you recall, Canin was recently allowed to return to teaching after being briefly suspended for assaulting a student over a political disagreement. Looking back, it seems that Garcia has never uttered a word publicly about the attack. Her failure to acknowledge and denounce this specific threat to the her students certainly calls into question her ability to “heal and lead” any kind of transformation. In that context, her entire diatribe is both insincere and hypocritical. But hey, why focus on addressing violence inflicted by your own employee when you can talk about Nazis instead?